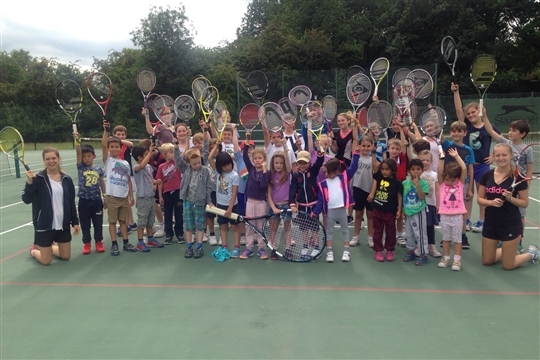 At RLTSC, in addition to a term time tennis school, we run very popular holiday camps with full day and half day options. Children are able to choose squash, netball, football or table tennis activities after a morning of structured tennis. Book on now to avoid disapointment! All lead coaches are fully qualified, DBS checked and first aid trained. All junior coaches are members of the club and have attended a 'tennis leaders' course. Any member of staff 18 years or older are DBS checked. Why should I book a place on RLTSC Holiday Camp? sessions. Therefore, children on our camp will receive quality coaching whilst having a great time. There will always be a qualifi ed fi rst aider on site and a fully licenced lead tennis coach. What should my child wear and bring along? left in the club house. Do you have multisport facilities? coach football, and netball and squash. the day. The snacks will include gelatine free options. Can I get somebody else to collect my children at the end of the day? your child and their details. What happens in adverse weather conditions? ensure high factor sun cream is applied and they have a water bottle with them. My child has never played before, can they still book on? more information contact Jordan on the details on the front page. We also have opportunities for parents to play tennis so we may even see you on court soon!